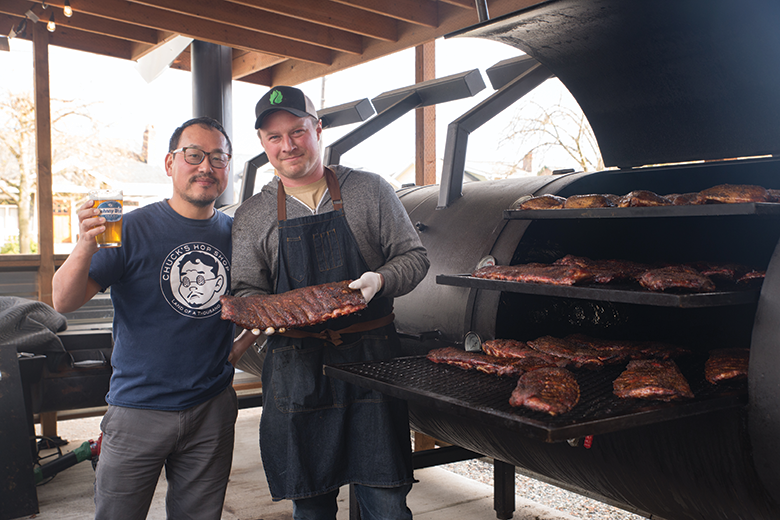 Top: Beer guru Chuck Shin and Jason Jacobs bring barbecue and beer together in their new Maple Leaf restaurant, Barbecue Smith. Shin swears the chicken is the best he’s had. 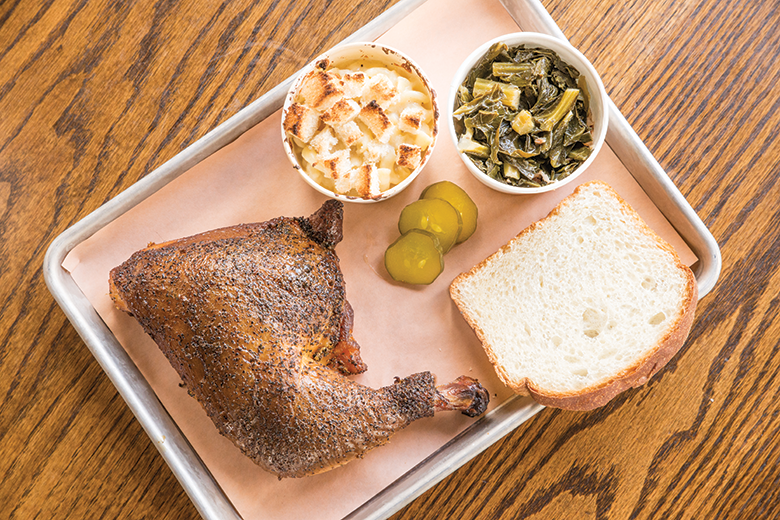 Above: the barbecue chicken plate with collard greens and mac 'n' cheese. If there’s a single Seattleite to thank for giving just-off-the-beaten-path neighborhoods the kind of community meeting places we all crave—the ones with beer!—it’s Chuck’s Hop Shop’s smiley, bespectacled owner, Chuck Shin. Though Shin’s new project, a counter-service corner restaurant called Barbecue Smith, is a departure from the Chuck’s name, it’s already rallied the community of Maple Leaf in a familiar Chuck’s way. This time, around both barbecue and beer. Shin’s mom’s kimchi shows up on the menu of sides, alongside more standard Southern fare, such as black-eyed pea salad—skippable in favor of the wonderfully tender collard greens with plenty of bacon (all $4). The parents weren’t wrong about that chicken: a quarter bird ($13 with two sides) goes down maybe too easily, so moist and flavorful and fall-off-the-bone tender that all that’s left is a picked-over pile of bones. The brisket ($17 with two sides) is also the real deal, with good bark and smoke ring—though like Jacobs, I’m not a homebred connoisseur. It’s best to eat the brisket first, before the fat has the chance to cool. Of course, this place wouldn’t get the stamp of approval from either man (or fans) without a killer beer list, and Shin has cultivated an enviable tap list of 23, with plans to add four more, from predictable favorites like Stoup, Georgetown and Chuckanut. Enjoy your beer in the back room, where the smell of slow-cooking meat wafts in off the patio. Must Try: Go on a Wednesday to try the massive beef ribs, as they’re only available on that day.